Kurangani is one of those offbeat places, breathtakingly beautiful, yet far away from the noisy city and also the tourist crowd who I try and avoid all the time. It was a perfect choice when I was looking for a quiet family weekend getaway. The place is so remote that no mobile with exception of MTS at places works there. Even my BSNL which is my personal favorite for connectivity at remote places where no private network works, meekly said ‘No Service’. While I love being off phones at internet when I go away and loved it this posed a great challenge for us when we were trying to confirm our booking in the government guest house and had to resort to cajoling our local theni contacts to help us with our booking. Kurangani made famous by the movies shot here – Myna, Kumki and Azagarsamiyin Kudhirai, is thankfully not hounded by tourists yet. 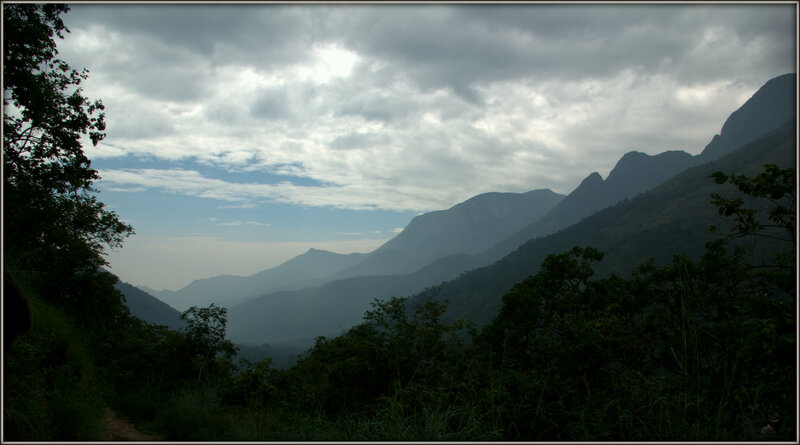 The mist surrounded Western Ghats are a delight to watch for any nature lover. Kurangani also is a great trekker’s paradise and is the starting point for the trek to Top Station via central Station, a much frequented route by the locals who claim it to be a three hour trek. But with my trek experience I know the trek time for even frequent trekker like me, would be easily double that of what localities say. This route follows an abandoned cable station, hence the name Central station and Top Station. Central or Middle station does not have road access and there is a small neatly maintained place to stay overnight. Since this is not an elephant corridor, you can even make your own campsites if you so prefer. The other awesome trek route here is the Kolukumalai trek route which is a tea estate and has a Zig Zag route with tea plantations on both sides. A moderate trek which has one of the oldest tea factories which process tea in a traditional way and is also one of the highest organic tea plantations in the world at over 7000 ft MSL. More about these, when I trek there, not much trekking this time around as I was with my family. Although we came in a car, we took a jeep for to Aadhi kadu a tribal hamlet a few Km’s away. We soon found Sambalaru Falls on the way and took a break to relax there. Sambalaru is the source of Kottakudi river and serves as the drinking water source for the Bodi town nearby. The off roading experience starts soon after Sambalaru Falls, it is quite a challenging and a thrilling ride up the hills. Aadhi Kadu did’nt quite have the tribal feel, where except for on abandoned local hut, all houses were made of concrete and were sponsored by the government to the tribals. The ladies wore saree in a traditional way which was similar to what we had seen in Kumki movie. Even older kids were being tied to their mothers back with the saree even when they were involved in arduous task near the house like washing clothes. The Forest watcher who had accompanied us told us that the tribals were both shy and fearful and are even hesitant to speak up to the government officials about their own needs. Aadhi kadu also provides a shorter trek route to central station and top station cutting down one or two hours from that of the Kurangani start point. This short trek gives us some breath taking views of Kolukumalai and a number of other surrounding coffee/tea plantations around dotted with smaller falls, which provide perennial water supply to this area and the ones nearby. A Visit to Kurangani can be complimented by one of the trek routes mentioned above or can be combined with Bodimettu and Munnar trip. Bodi is the nearest town around. You can take the bus to Bodi/Theni and a local jeep from there to Kurangani. Munnar Via Bodi Mettu is an awesome drive from here. Local guides can be arranged for the trek to Top station or Kolukkmalai Trek from. Kurangani. They even arrange for food and camping tents. Public transportation to and from Kurangani is limited to a few buses in the day. If you plan to use them, ensure you timing your descend from the trek to match it. As always the best place to obtain this information is from the localities there. Most localities are extremely helpful but have a flexible sense of time, so please provide for the same if you plan to hire local guides. Other than MTS, no mobile services work(ed) here. Landlines prevail if you can get hold of them.